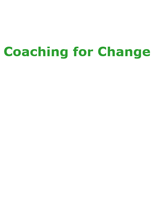 Learn the art of “coaching for change.” The Coaching for Change Institute offers intensive professional development to instructional coaches and lead teachers. Focus areas include: introduction to instructional coaching, lesson preparation and delivery, and learning strategies and scaffolding. Participants will explore school culture, motivation, and sustaining an active learning environment.